The most predictable game on Instagram has become a brand or blogger offering followers a “chance to win” by following that particular account and a cadre of other, likeminded accounts. Sometimes followers also need to comment or tag a friend to further amplify the accounts being marketed. Similar co-branded contests exist via e-mail, where one can enter to win a prize that’s sponsored by a group of brands, essentially by signing up for the e-mail marketing lists of all those brands. Depending on how naturally-related the groups of brands are and other factors, companies and bloggers may get high-quality, long-term followers or subscribers. In many cases, there’s attrition following that bump. While I think these Instagram pods and co-branded sweeps can be valuable, they’ve gotten old quickly. So I was happy to see brick-and-mortar taking a page from digital’s book this weekend and promoting retail store experience. I got the news, below, from ADAY’s e-mail list. 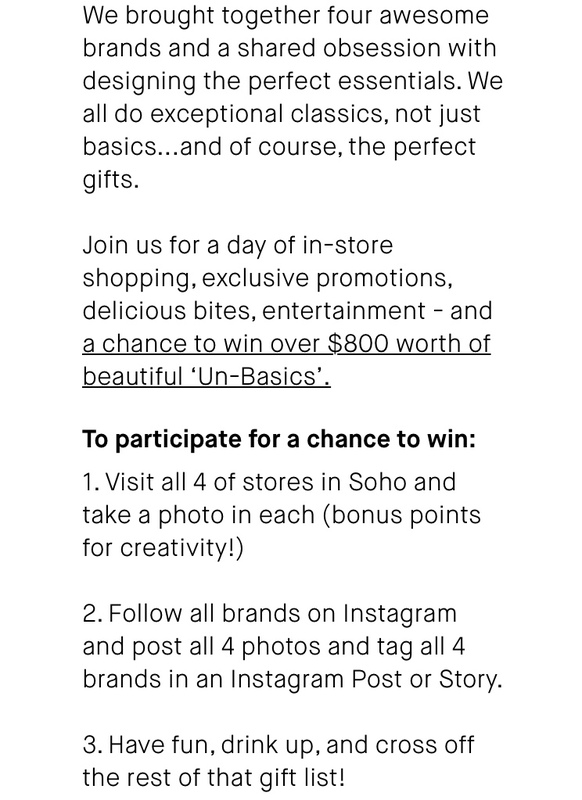 Four independent brands - ADAY, Sezane, Snowe, and Krewe - marketed a “scavenger hunt”, urging shoppers to visit each of their Soho stores yesterday for drinks and gifts with purchase tied to holiday shopping. While I think some of the stores could’ve done more to be eventworthy, I liked the marketing angle and had positive store experiences (especially at ADAY, where I’m a loyalist, and Snowe). There’s so much potential for more event series and partnerships like this. And undoubtedly, customers acquired this way are infinitely more valuable than Instagram followers.